From an elegant wedding ceremony to large-scale charity ball or corporate event, Mezzo-Soprano Joëlle Morris uses the power of song and voice to help you make your special day or event a truly memorable one. 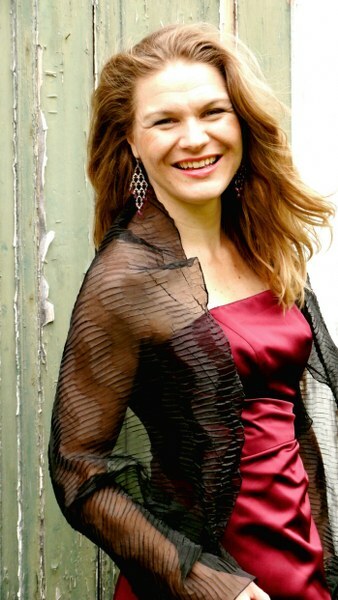 With a large extensive repertoire including Classical Arias, Popular Ballads, Jazz Standard, Musical Theatre and Opera Arias, Joëlle combines the perfect ethereal voice with grace and elegance. Fluent in both English and French, Joëlle is at ease singing in numerous languages, including French, English, Italian, Latin, Spanish, Portuguese, German, Hebrew, and Yiddish. Joëlle is a thorough musician who can communicate well with your church’s own organist or is able to provide accompanying musicians and backing CDs if required. Joëlle is also happy to perform unaccompanied, which, depending on the songs and venue, can create a powerful effect. For more information regarding wedding services and fees please don’t hesitate to contact me to request a brochure and FREE DEMO CD. C’est si bon! Sung both in French and in English, be ready for a wonderful collage of your favorite French songs by Edith Piaf, Charles Trénet and Yves Montand with songs such as “Beyond the Sea”, “Autumn Leaves” and “La vie en Rose”. This collection of nu-jazz swing and martini music embodies the sound and feel of a popular café overlooking the Seine river. Showstoppers: A selection of Broadway, Opera and Operetta A wonderful and witty evening showcasing the best Show tunes and Arias to ever grace the stage including works by Bizet, Offenbach, Kurt Weill, Andrew Lloyd Webber and Sondheim featuring songs such as Carmen’s “Habanera”, “Send in the Clowns” and “Memory” from Cats. Women Who Dared – Women Composer Recital – Featuring the lyrical melodies of Amy Beach, Libby Larsen, Lili Boulanger, Pauline Viardot, Clara Schumann and Fanny Mendelssohn. Includes a discussion on the life and challenges each woman composer faced during her time. Postcards from Europe – Art Songs selection by legendary European Romantic composers including Claude Debussy, Richard Strauss, Vaughan Williams, Manuel de Falla and Gioachino Rossini.